Beside TheGuitarLesson.com, which offers some of the highest quality guitar lessons for beginners on the Internet, another powerful course that is great for beginners is Learn and Master Guitar with Steve Krenz, which is a DVD course shipped to your home. The course is somewhat pricey, but you can now get a nice discount on Learn and Master Guitar on Amazon. Now as I said, I very rarely recommend other guitar courses, simply because I don't think that there are too many good ones out there. In fact, this is only the second time I've ever recommended a 3rd party course. You'll know from my guitar lessons on songs, that I aim for the highest possible standards in editing and valuable content. 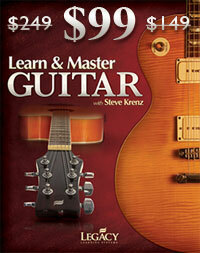 And so does Steve Krenz's guitar DVD course. His lessons are well structured, and provide an effective way for beginners to reach an intermediate level of playing in a reasonable amount of time of around 20-30 weeks. This time frame may look scary for beginners, but believe me, I've taught about 100 people privately, and thousands online through my website. There are no shortcuts to learning the guitar, but if you learn from effective, structured material, your learning curve will be much shorter than of those who choose to learn from random YouTube guitar lessons. L&M Guitar with Steve is a very well structured, superbly edited course, full of valuable, timely content. And now that you can get the Learn and Master Guitar discount of 33%, it is worth the investment. The only problem I found with Steve's course is that he focuses a LOT on technical elements, but doesn't provide any good songs to practice them with, only rigorous exercises. This can get a bit tedious, but I've come up with a solution! If you purchase Learn and Master Guitar through my website, I will give you my $9 commission in the form of a 1 month membership to my website, absolutely free. The techniques you learn with Steve's course, along with the songs you'll practice with my guitar lessons on popular songs is a really effective and valuable combination. Discounted Learn and Master Guitar + Free TheGuitarLesson.com = You ROCK!!! To be eligible, you MUST purchase the discounted Learn and Master Guitar course after click on one of the links on this page, for example this link 🙂 This allows for the purchase to be tracked to my site, I get the commission, you get the DVD course AND a free 1 month membership to TheGuitarLesson.com. Nice and simple. Again, I want to emphasize that I would not have partnered with Steve if his lessons weren't of very high quality, and didn't live up to my quality standards and expectations. His course offers great content, and a great value for money at the discount price of $99, which comes out to $5 per DVD. The combination of his course and my lessons on songs can, and will get you to a strong intermediate level of playing, provided you practice the things you learn. So go ahead, order Learn and Master Guitar at the discounted $99 and contact me afterwards, and I'll set up your free 1 month premium membership. This is a great deal that doesn't come around too often, so take advantage of it before it's too late. You’re right, they must have taken it off for the time being. The $99 sets were previously owned (returned) packages, I guess they don’t have any at present. I cannot find the $99 price for the learn and master guitar software. Is it still available? I called the 888 number, but they are closed for the holiday. Yep, but the $99 version of L&M guitar is sold out at the moment, but they’ll probably have more later on. Congratulations on the site ! Is the promotion still valid ? Can I get both this one and the Guitar Pro ? Sorry about that, the link is working fine now and leads to the $99 discounted purchase page. They changed their tracking system, thats why the link wasn’t working. Hi there! Thanks for posting the article and introduction about Learn and master guitar, especially the discount thing! Thanks to the discount price you have offered here which makes me feel that I can afford the a copy for myself! I really want to buy it, could you please help me out? with the discount price you have mentioned above. great course and together with your website’s membership. Please let me know if it is still available with $99 and how can I get it. know if $99 price is still available. Yes, it’s the expanded version. Is the previously viewed copy the the expanded version. The picture suggests it, I just wanted to double check. Of course, just send me an email once you complete your purchase and I’ll extend your premium membership. Cool combo Tom,but I already have a membersip to your site,can I still get the 3 months if I buy the l&m dvds now?